What to do with your old step treads? You finished pulling down your old timber stairs, now you could throw away the old timber step treads, or you could try something a little different. What I am talking about is you could turn your old steps treads into a coffee table, which will be the envy of all your friends. 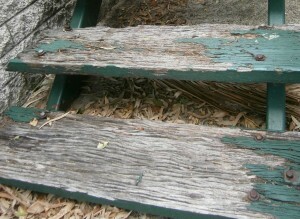 I am not going to lie, this will take some effort especially if your old step treads that are really weathered like the ones in the first photo. Here’s how to build your new coffee table, start by giving your old treads a good sanding on four sides. Now glue your step treads together side by side using small joining dowels (these are available from all hardware stores including the drill bits and mark gauges) and clamp tight. Next you will need to sand the top until you reach your desired finish, if you like all the rustic look you won’t need to sand as much as someone that wants a smoother finish. Now cut the ends of your table top, either to the size you would like or so the ends are nice and straight. After the top is made, you will need to make your legs and surrounds (the surrounds are the sides that connect the legs together under the table top). To make the legs simply use the offcuts from the posts and for the surrounds use the off cuts from old floor joists. Turn the table top over and mark where you want the legs and cut the surrounds to sit in between the legs. To fix the legs to the table top you will need to glue and dowel the legs to the surrounds (this may get a little messy) and then screw the surrounds to the underside of the table top with the legs attached. 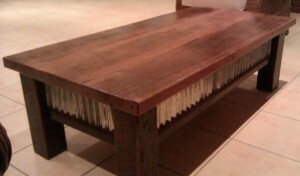 Time to sand your new coffee table one last time and coat with some vanish, stain, bees wax or whatever you would like. I do need to warn you before you embark on this endeavour, you friends will want you to make one for them, so best not to tell them if you have any leftover step treads. Previous PostPrevious Double Floor Joists: What are they and why use them?